The care and display guidelines for the American flag can be quite confusing, opening situations that cause etiquette faux pas. It can be quite confusing if you didn't learn it in school or you came from another country. It is important to learn a few facts that can help clear up some of the confusion. Most of the guidelines are easy to follow. The basic idea of following proper protocol with the flag is to show respect for the country. The American flag is designed with thirteen horizontal alternating red and white stripes and a blue rectangle in the top left corner with fifty white stars. The stripes represent the original colonies, and the stars symbolize the fifty states. The U.S. government has a set of rules for manufacturing, using, and disposing of the flag. However, these are specifically for flags made or used by the government. Other flags created for personal or commercial use do not have to abide by these stringent restrictions. Even so, proper etiquette dictates respect for the flag, regardless of use. When displaying the flag, there should be light on it at all times. This includes sunlight or another source of light. This is the reason outdoor flags are raised at many government institutions at sunrise and lowered at sunset. When lowering the flag, it should never be allowed to touch the ground, floor, or anything beneath it. If you display the American flag with another flag on the same pole, the U.S. flag should be above the other flag. When flying the U.S. flag with flags from other countries, each flag should have its own pole, and the flags must be positioned at equal height. When displaying an American flag, it should be right side up. When in motion, the union part of the flag should lead. That means that the blue rectangle with the stars should go ahead of the stripes. When the flag is hung, the blue section with the stars should always be on the upper lefthand side. An American flag made by or for the government should never be worn or used for advertising purposes. This simply means that you should not repurpose a federal flag for anything else. You may have an article of clothing with a flag motif or use a flag design when advertising a product, service, or business. When the flag needs repair, it should be mended and restored to its original condition. However, if it is no longer possible, it should be burned with dignity or properly folded and sent to the American Legion, Boy Scouts, or Girl Scouts. These organizations perform proper retirement ceremonies for old flags. There are certain days that a flag should be flown at half-staff (also called half-mast). The flag should be quickly raised to the top of the pole and then lowered to the halfway point. When lowering the flag at the end of the day, it should be raised to the top of the pole and then lowered to the bottom. The American flag must be respected at all times. This includes times when it is saluted, during the Pledge of Allegiance, and while listening to or singing the National Anthem. The flag should be faced during all of these events. When reciting the Pledge of Allegiance or singing the National Anthem, it is traditional to stand erect with your hand over your heart. If you are wearing a hat or cap, it's considered most respectful to remove it. Military personnel should give the proper salute as dictated by military policy. 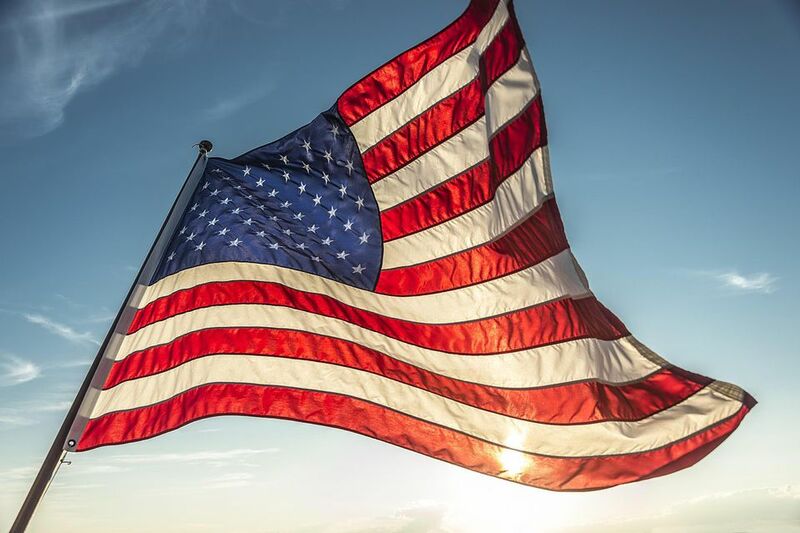 When a military veteran is buried, the U.S. government will provide a flag to drape the casket for those who qualify according to the U.S. Department of Veterans Affairs. The flag should be positioned with the blue rectangle and stars at the head of the casket, and it should be removed before lowering the casket into the grave. After the burial ceremony, the flag is folded and given to the family of the deceased after the funeral. Many families display this flag in a place of honor in their home or office. One thing the U.S. doesn't do is punish people for not the obeying proper etiquette of respecting the flag. You are allowed to protest or make a statement by not observing it without the worry of being arrested. That said, there are people who gave their lives for the right to do this, so think about your actions before you decide to ignore conventions.